Mittelgroß, mittelkräftig, guter Ausdruck, gutes Gebäudeverhältnis, genügende Gesamtfestigkeit, etwas flacher Widerrist, etwas kurze Kruppe. Normal gewinkelt in der Vorhand, gut gewinkelt in der Hinterhand, vitales Gangwerk, der Vortritt sollte ergiebiger sein. Sicher im Wesen, Härte, Mut und Kampftrieb ausgeprägt; läßt ab. This seems to be a really healthfull specimen, strong, harmonic and caracteristic dog and we start to think what is correct! 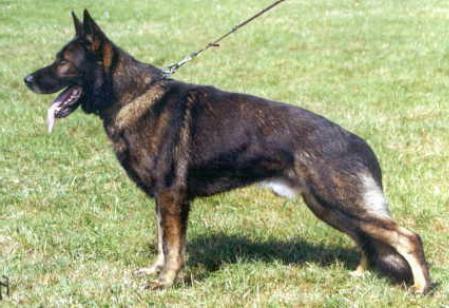 A dog that can work and be an auxiliar or a dog mesured inch by inch to achieve conformations rigid exigencies in terms of forms angulations, collor (believe me or not) and that produces dogs that just cant do the job. The idea is not to produce an animal with no reason to exist, but to produce an dog that we are glad that exists! The real and functional GERMAN SHEPHERD! Thats time to change our mind and put both worlds toguether!